Hey there! I'm Sammi! People call me Freak! I don't know why! So I'm full of energy! So what if I pester my siblings! 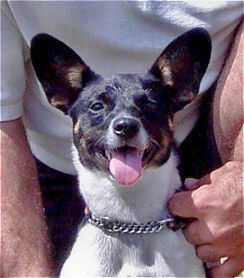 I'm just being the Rat Terrier that I am! I was rescued from Oregon in February 2002. I was about seven months old then. I moved up north and now I live with my humans Bret, Annette and Kaitlyn, and canines Zak and Keelah. My strongest personality trait is... what?! Dad is muttering something about "Tasmanian Devil". Umph. Well anyways, I started flyball training just after I moved, and I ran in my first tournament in August 2002, just six months later. 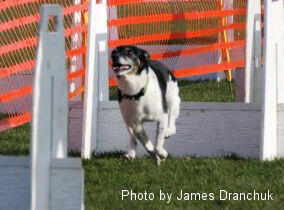 I guess when you live in a flyball family, it's just natural that you'll play the game. I'm one of the height dogs on the Division 2 team, and the shortest dog in our club. I'm pretty zippy on the way up to the box, but I give my Dad a good challenge on the way back. There's just so much else going on that I have a hard time staying focused on him! He's working really hard with me though, so I'm sure we'll get through it. As it stands, I still have an average time of 5.3 seconds and a best time of 4.6 seconds. When I'm not running at flyball, I like to pester my teammates. Some of them put up with me better than others, but Dad's always ruining my fun, telling me to leave them alone. And my special tricks - I'm very talented! I can play dead, spin, roll over and even launch off Dad's body!